Australia's waterways are amongst our biggest assets, thus should be adequately protected. A new range of stormwater drain filtration units are currently being trialed throughout Australia. Helps eliminate hydrocarbons and other contaminants such as metals, sand, silt and litter from stormwater runoff. Inserts are placed behind and below the opening of the curb inlet and are available in various lengths for the application. Designed to eliminate the use of sandbags during construction. Re-usable, adjustable and adaptable to all site-specific requirements. High density polyethylene plastic with UV inhibitors. Variety of sizes and configuration available to prevent, hydrocarbons, coolant, contaminants, silt, sediment, litter and debris from entering into storm water drains. Round, square or rectangular. 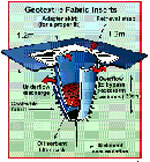 Designed to contain oil and sediment and silt. Easy to service and lasts up to six months if regularly serviced. Three variations available for internal of external drain applications. This floating skimmer is filled with K-sorb and is inserted into drains to collect oil and hydrocarbon deposits. The skimmer sits on the bottom of the drain pit until water enters. 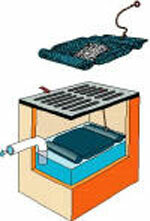 At this time the mat floats to the surface of the drain and absorbs oil and other contaminants as they enter the drain. The K-sorb filling should be replaced regularly to ensure effectiveness of the unit. Ideal for primary and secondary spill containment. Suitable for use on smooth surfaces. Uses your existing trench drain as part of the capturing device for debris and hydrocarbons.